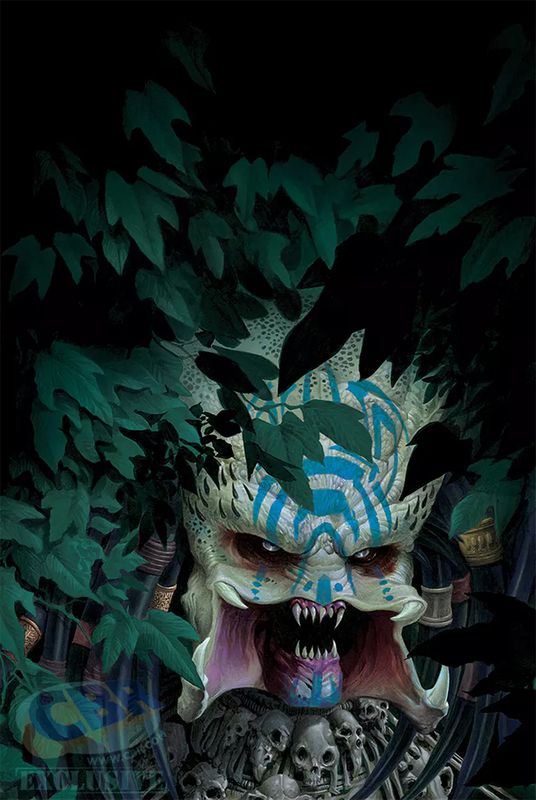 Dark Horse Announces Predator: Hunters! With Dark Horse’s Life and Death crossover event scheduled for completion with Prometheus: Life and Death – One Shot on Alien Day, it had looked like we wouldn’t be seeing any new Predator comics. Fear not though! 2017 marks the 30th anniversary of Predator’s release and to celebrate Dark Horse has announced (via Comic Book Resources) a brand new comic series to go alongside their re-issue of the original three Schaefer Predator comics. Doug Wheatley’s cover art for Predator: Hunters #1. If you head on over to Comic Book Resources you can check out the full announcement and get a look at some interior artwork from the upcoming Predator: Hunters ashcan story. Predator: Hunters #1 is slated for release in May 2017. Thanks to Ultramorph for the news. Keep checking in with Alien vs. Predator Galaxy for the latest Predator news! You can follow us on Facebook, Twitter and Instagram to get the latest on your social media walls. You can also join in with fellow Predator fans on our forums! Regarding the re-canonization of some of the old Predator EU, I personally think it would be neat if Dark Horse found some way of re-canonizing some of the old Aliens and AVP EU with the new stuff. Some stuff, like the whole Earth War arc, would obviously have to be ignored though. We've got another thread about it, but it'd be trivially easy to re-canonize large swaths of the old AvP/Aliens EU. Heck, i wouldn't be surprised if they took the Star Wars Legends approach. hmmm....sad that Chris is not doing the art. best Predator artist by lightyears. I am excited for this! The premise reminds me of Freddy versus Jason versus Ash: The Nightmare Warriors. In a good way! I reckon this will become the focus of "present" Predator comics, while the "future" ones will work with the Aliens and Prometheus comics. And a variant covers are all being done by Francisco Ruiz Velasco. Since we're getting returning characters, fingers crossed Maya Bergstrom from Homeworld has a cameo. Probably not, though. I wonder if the humans tasked with fighting the Preds will be called Spearhead. A Xenogenesis reference would be pretty bold. Did Fox/DH ever actually say that they were de-canonizing the non AvP predator comics? I assumed the re-boot only really applied to aliens and somewhat to AvP, the present day Predator stories never really backed themselves into a corner vs the films like aliens did by infesting earth. They really never did, but yeah the old Predator comics would largely be very easy to re-canonize (and it looks like that's the route they're taking). It helps that 99% of them are set either in "the present" or some point in the past. I just assumed they decanonized EVERYTHING but the films, I mean it's not unreasonable to assume that since well... back in 2013 they did say they were hard rebooting everything. Kind of got mixed opinions about this. That would certainly appear so. This is a surprise. So it looks like that some of the old EU might be canon again. Kind of like how some of Star Wars Legends is, right? Reminds me of the "South China Sea" Book. I have never read the book but did get a slight vibe of it from synopsises I have read. What I find interesting is this theme of reacquainting us with the concept of Predators hunting Predators. Not saying that this series will but the announcement takes care to talk about Bad Blood. I can dig it. I like how it's bringing back old characters (and essentially "re-canonizing" those old stories in the process). Looks interesting, art is pretty decent. The premise is almost like Xenogenesis, only hopefully more competent. Beat me to this info by 1 min lol. This is interesting. Like the art style. I wonder if Dutch, his brother or Harrigan will have a role?